The Great Eastern, launched in 1858, was impossibly enormous. She defied the technology of the day, a marvel that had one foot in reality and another seemingly in some sort of steampunk science-fiction realm. A vessel that pushed the envelope of what was scientifically possible in the mid 19th century was bound to be plagued by accidents and malfunctions. It is no wonder that persistent rumors surrounded the unlucky vessel alleging that she was cursed or even haunted. The ship was designed in 1854 by Isambard Kingdom Brunel, a brilliant civil engineer and naval architect. He envisioned a passenger and cargo vessel that could steam from England to Australia or India without stopping for fuel. This concept dictated her size as she would need to be huge in order to carry enough coal. Nearly 700 feet in length, and roughly 20,000 tons, she was about five times larger (by tonnage) than any ship afloat at the time. How often has a construction record made a quantum leap of five fold? 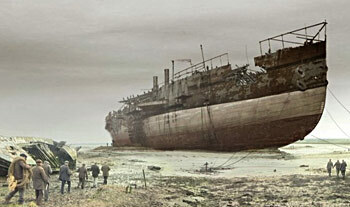 A larger ship would not be built until 1901, placing the Great Eastern about four decades ahead of her time. She had berths for 4,000 passengers, a record never exceeded in an ocean liner (not even by the Queen Mary 2). In order to move such a monster, Brunel came up with an unprecedented design incorporating three different means of propulsion: side wheel paddles, a screw propeller and six masts of sails. The hull would be entirely iron. While under construction, a friend told Brunel, “…The world hasn’t grown up to her…” and advised him to turn the enormous ship into a pier. Six men were killed during the construction. Another two during the first attempt to launch her. This fiasco caused a delay of several weeks between her christening and her eventual launch, something many seafaring men believed to be back luck. After she was finally afloat, five men were killed during her sea trials when one of her boilers blew up. The accident caused an explosion of scalding steam to fill her elegant saloon, which might have killed many more if not for the fortunate fact that virtually all the passengers were up on deck at the time. By this time, the strain of building, launching and testing the massive vessel had ruined Brunel’s health. He suffered a stroke in 1859 and died the same day he was told of the boiler accident. 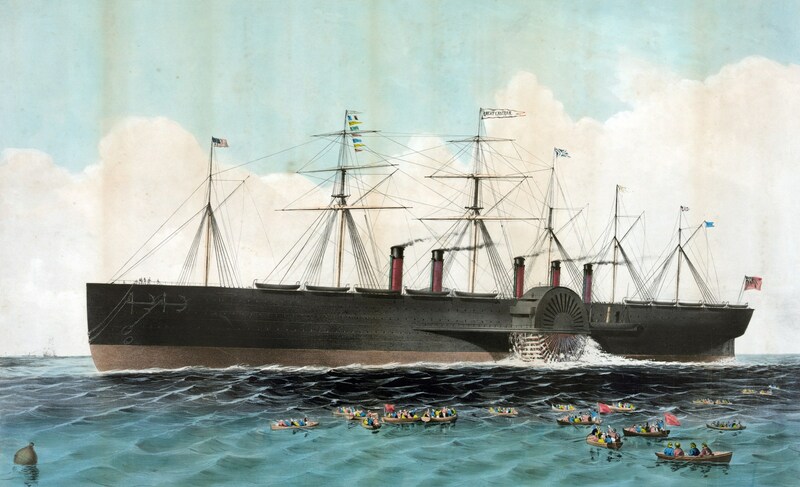 When the time came for the Great Eastern’s maiden voyage in 1860, her owners decided that voyages to the Far East would be too expensive for a ship of her size and instead committed her to carrying immigrants from England to New York. During her early voyages, crewmen and passengers were disturbed by a persistent pounding seemingly coming from inside the double layered hull. This led to apocryphal stories of a workman who had gone missing during construction and who was accidentally sealed up inside the hull. His ghost, so the story went, pounded away on the hull, hoping someone would set him free. There is documentary evidence suggesting that even the captain of the Great Eastern was unsettled by the peculiar hammering. After the ship struck a rock off Long Island, New York, opening a gash far larger than the one that sunk the Titanic, it was discovered during the subsequent repairs that the banging was the result of a loose joint on one of the paddle wheels. Eventually, her owners realized she was just too large to be profitable in the passenger business. She could not be filled and there were few ports large enough to accommodate her. So, she was refitted for laying telegraph cable and played a historic role in laying some of the first transatlantic telegraph lines. She was about the only ship afloat that could hold the necessary thousands of miles of cable for such tasks. One of these cables landed in Duxbury, Massachusetts. Even in this role, she could not make a profit. Too far ahead of her time and too expensive to operate, she became a symbol of engineering folly and was laid up at Liverpool in 1874 waiting to be torn into scrap. This was finally accomplished in 1889. Unfounded rumors persisted that a skeleton was found inside her hull when she was torn apart. During one of her cable laying voyages in 1867, a French author named Jules Verne traveled on the Great Eastern. The voyage inspired him to write a novel called A Floating City which was set on board the huge vessel. And I have little doubt that Brunel’s staggering achievement, something almost too impossible to exist at that time, set Verne to contemplating what other technological marvels might soon be achieved by engineers. Perhaps there is even a little bit of the Great Eastern in the Nautilus of Verne’s Twenty Thousand Leagues Under the Sea written three years after his voyage.